The Housing Tides Index increased one point in August, indicating modestly improved housing market conditions from one month ago. The Index is at 73.2 after scoring 72.2 in July and remains in healthy territory. 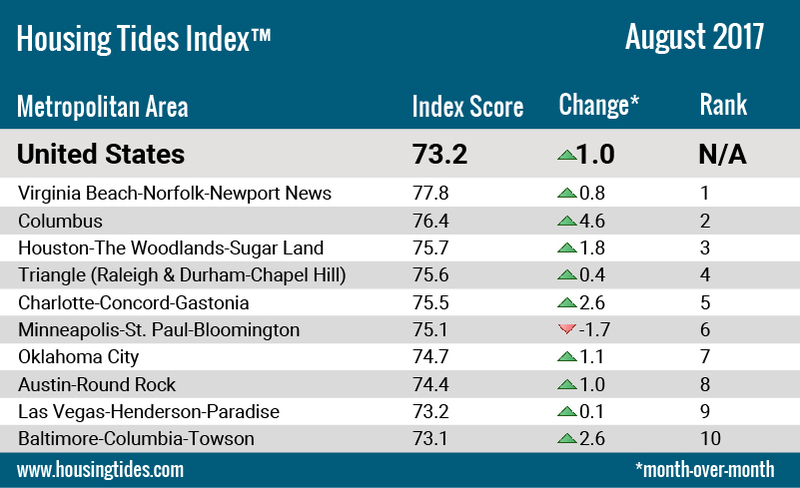 This month’s Index update reveals an improvement in housing market health as 32 of the 41 markets tracked by Housing Tides saw improved conditions. This week marks the release of the August Housing Tides Report™, featuring an update to the Housing Tides Index™, an objective and sophisticated approach to quantifying and comparing the health of U.S. housing markets. 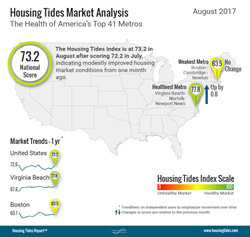 This month’s Index update reveals an improvement in housing market health as 32 of the 41 markets tracked by Housing Tides saw improved conditions. Real estate brokerage Redfin reported that there were nearly 95k fewer homes for sale in the U.S. in June when compared to June 2016. At the current sales pace this inventory amounts to just 2.5 months of supply, a post-recession low and far below the six months of supply that is regarded as balanced between supply and demand. Consequently, the median price for homes sold reached $298k in June, its highest level since the company began tracking the data in 2009. Median sales prices have risen 7.6% from $277k in June 2016. The U.S. Case-Shiller Index of home prices also reached an all-time high in May per latest data from S&P and CoreLogic, and is up over 5.5% in the last year. Home price gains continue to exceed wage increases, as U.S. per capita personal income was estimated at just over $50k in 2017Q2 and had increased only 2.1% from one year ago. It’s clear that homebuilders have ramped up the pace of construction in an effort to satisfy the sustained demand for housing. Census data show that there were 81.8k U.S. single-family permit approvals in June, the highest monthly total since August 2007. This observation gives reason to be optimistic about new construction efforts helping to balance the market between buyers and sellers and ease home price increases. However, we should note that the Census Bureau estimates June housing permits at a 1.28M seasonally-adjusted annual pace, which remains lower than the approximately 1.5 million units the country needs per year. Using Census data, we estimate the long-run average pace of homebuilding was 1.45M units per year prior to the onset of the 2007-09 recession. According to the Census Bureau, the U.S. rental vacancy rate has increased in the last four quarters and reached 7.3% in 2017Q2. In June we noted that the number of apartments under construction had reached a forty-year high and it’s apparent that the completion of these units has begun to put upward pressure on the vacancy rate. It’s likely that the increased vacancy rate will suppress rental prices and as such may translate to lower demand in the purchase market as consumers incorporate these price effects into their buy-or-rent decisions. Assuaging worries about the uptick in mortgage delinquency observed in April, latest data from Black Knight Financial Services showed that the delinquency rate resumed its long downward trend in May. The delinquency rate is now at 3.79%, still higher than the low of 3.62% in March 2017, but considerably lower than levels observed in recent years. As noted above, single-family housing permits increased in June, with 42,500 permits approved across the 41 markets tracked by Housing Tides. This is the highest total in these markets since June 2007. Multi-family permits rose by over a third in June, totaling 31,800, and the six-month moving average increased to a rate of 24,400 per month. Please reference the attached graph to view the Ten Healthiest U.S. Housing Markets - August, 2017.